1. The Employee Engagement Pyramid What are the 10 actions managers can take to turbo charge employee engagement? Engagement is more than a feeling, survey number, or a YouTube happy dance. We engage in actions directed towards results. The first key to consider when acting to increase employee engagement is what results are you working to achieve and how can you involve all employees in formulating those results or achieving those results? Powerful results matter to managers, organizations, employees, and customers. 2. Employee Engagement: 33 Keys for Engaged Wellbeing What do we see when we take a closer look at engaged well being in the workplace? 3. Employee Engagement: A New Buzz on Engaged Branding Through Community Co-creation What brand new things will happen when we give honeybees an opportunity to play with a Starbucks mug in their hive? The buzz. I believe we need to offer more white space in our organizations with employees and customers to help us create both our organizations and our brands. Our customers and our employees may surprise us with their innovations, even more than a community of honeybees given one week to work with the new open logo of the Starbucks cup. We need to look carefully at the the physical and experiential invitational structures we create in organizations to foster collaboration, co-creation, and community with our employees and customers. 4. Employee Engagement and the 3 Word Theme: Stop, Focus, and Finish Do you have a 3 word theme to guide your work engagement for 2011? 5. Employee Engagement: What’s Up with Gamification If 2011 was the year of gamification, what are you playing? I believe gamification is one of the key engagement approaches and tools for 2011 and beyond. I think the big challenge will be to ensure these approaches are meaningful, authentic and operate for conversion into work rather than a diversion from work. We must be on guard for the manipulative elements of gaming and the potential lack of spontaneous playfulness in work. We must be aware of the potential negative impact of gamification to foster engagement, achievement, and work. Having said that, I believe gamification can be a very valuable tool towards fuller engagement and corporate social responsibility. 6. 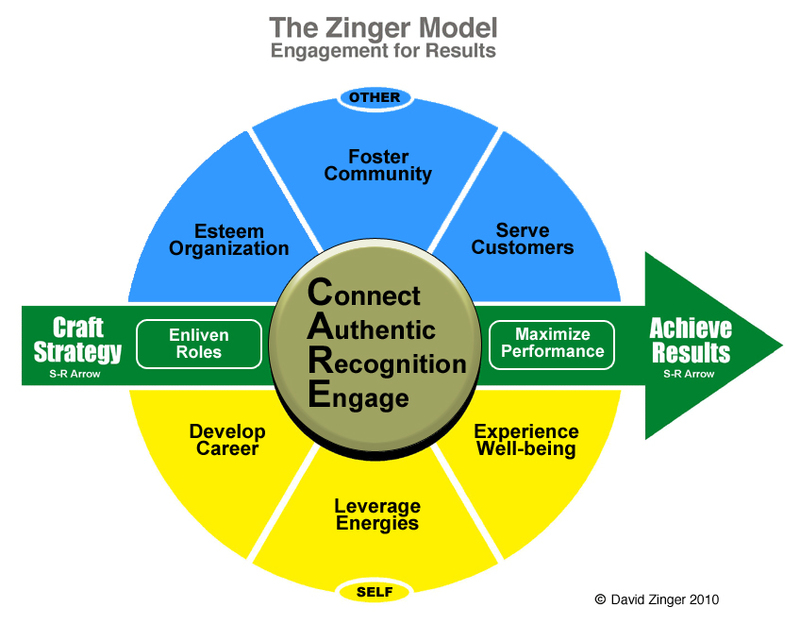 Employee Engagement: 33 Ways to Engage Today How do you engage the day? Focus on the work right in front of you. Savor your morning cup of coffee. Connect to your peers. Esteem your organization. Laugh to keep perspective. 7. 21 Ways Employee Disengagement Hurts How does employee disengagement hurt? David Zinger is focusing 2012 on the 10 things managers must do to achieve full employee engagement. Based on the pyramid of engagement, this approach offers managers a powerful structure, process and tools to create and sustain engagement. This pathway to power engagement is offered to organizations and individuals as a two day course, a one day course, a half day course and shorter presentations. Contact David Zinger today at 204 254 2130 or dzinger@shaw.ca to create an engaging 2012 where you work.